The dry Santa Clara River means that water needs are met by using subsurface groundwater. 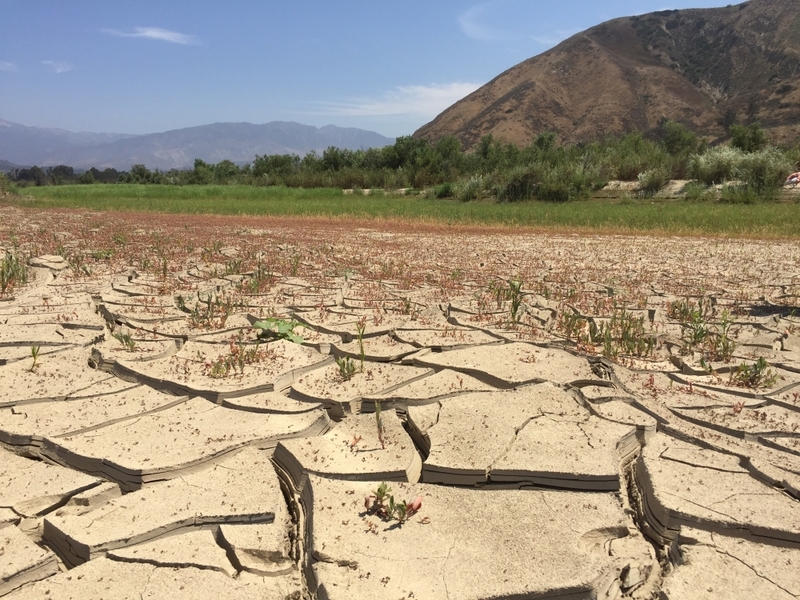 Scientists at UC Santa Barbara are studying how riparian forests respond to climate change that manifests as hotter and drier conditions over time. With $2.5 million in combined funding from three grants, Michael Singer, a researcher with UCSB's Earth Research Institute (ERI), and colleagues seek to understand the impact of nonstationary climate — trends in temperatures and precipitation — on riparian forests. Through the National Science Foundation's Geography and Spatial Sciences Program, one project — led by associate professor John Stella of the State University of New York College of Environmental Science and Forestry (SUNY-ESF) — is being conducted near UCSB in Ventura County's Santa Clara River Valley. A basin with competing water needs — ecological, urban and agricultural — the Santa Clara, because it goes dry, relies largely on subsurface groundwater. Continual pumping of groundwater from the aquifer for agriculture, when that aquifer is not recharged by rainfall, causes wells to go dry and forces pumping efforts to reach deeper and deeper. Innovative new legislation in California, the Sustainable Groundwater Management Act (SGMA), shifts the management of groundwater resources from the state to local basins, requiring regional stakeholders to create action plans for managing water resources. With the grant, Singer and Stella will collaborate with UCSB geography professor Dar Roberts and The Nature Conservancy to develop an improved understanding of forest health along the Santa Clara River. They'll investigate matters including what happens to trees that are rooted at depths below the surface with diminishing groundwater, and their findings can be used to administer SGMA. Through another NSF grant, in its Hydrologic Sciences Program, Singer, Stella and ERI director Kelly Caylor, also a professor in UCSB's Bren School of Environmental Science & Management, will study riparian forests along a major European river. The Rhône, which flows through France from Lake Geneva to the Mediterranean Sea, warms 2 degrees Celsius along its climate gradient. The researchers plan to measure the variation in temperature, precipitation and climate to model what might happen under climate change and determine how water availability to forests shifts due to climate and how trees are using water, as well as their corresponding growth and health outcomes over time. “In all of these studies, we're developing water stress indicators, which can be physical manifestations such as dropping leaves or branches or trees becoming less green,” Singer explained. “Such markers can be seen in remote sensing imagery and tree-ring isotopes, but we're also looking at climate records for precipitation and temperature, along with numerical modeling to determine what type and how much water has been delivered to a basin in the first place. If we see trends that tell us the forest is really suffering, we hope to establish an early warning response window in which managers can act quickly before important patches of forests are lost. Given California's changing climate, should Sierra Nevada residents replant pine trees after so many died during the 2010-2016 drought? The short answer is yes, says Susie Kocher, UC Cooperative Extension forestry advisor. 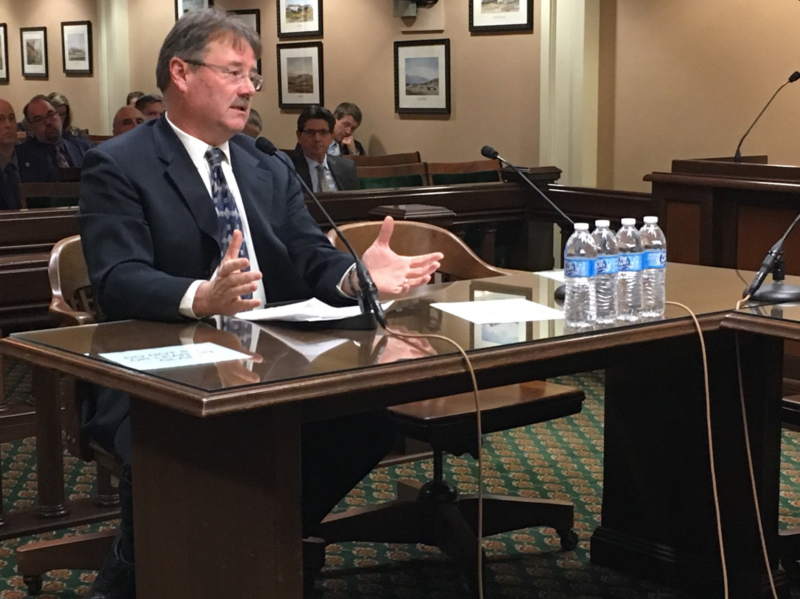 “We have every reason to believe that pines will continue to be an important part of mixed conifer forests in the Sierras,” Kocher said. Kocher spoke at a meeting for UC Master Gardeners, volunteers who provide landscape advice to the public in California. Questions have been coming in to Master Gardener hotlines from mountain residents wondering what to do after unprecedented tree loses in the last few years. Most California forests are suffering from severe overcrowding due to 100 years of aggressive fire suppression and selective harvesting of the largest and most resilient trees. They were then subjected to five years of drought. 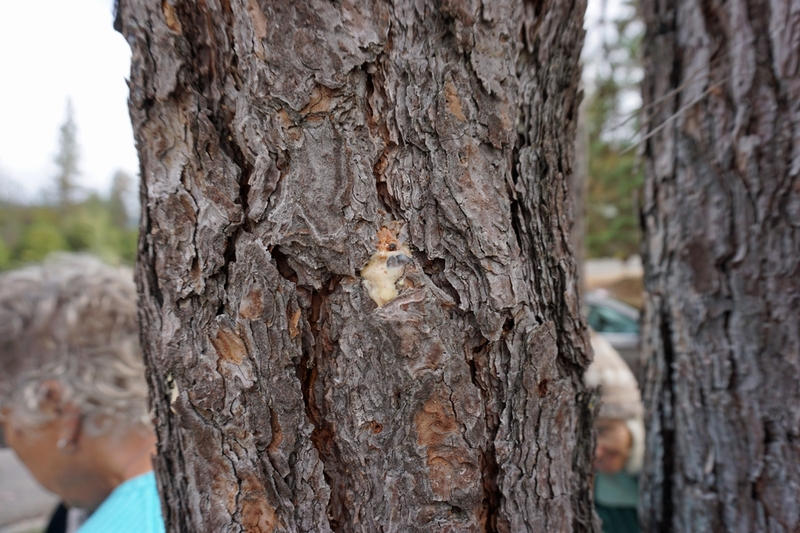 Western pine beetle is a native pest that attacks larger ponderosa pine and Coulter pine trees weakened by disease, fire, injury or water stress. Bark beetles are tree species specific, so other beetles target other species of trees in California's mixed conifer forests. Typically, bark beetles bore through tree bark and create long winding tunnels in the phloem. An aggregating pheromone attracts additional bark beetles to the tree, and heavily attacked trees invariably die. 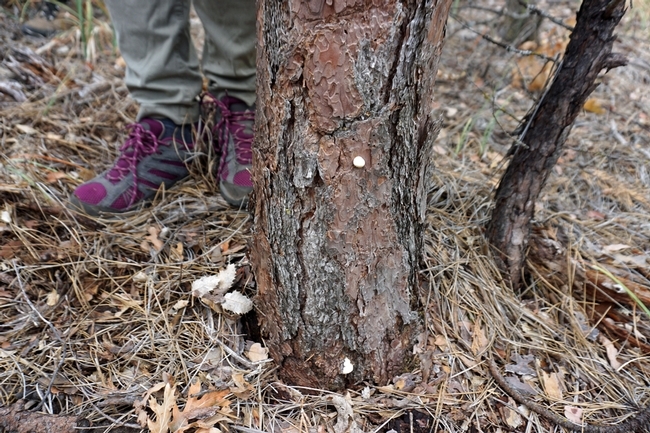 Healthy pine trees can fight off bark beetle attack by secreting pitch. Trees weakened by drought are unable to fend off an attack. In this photo, a pine beetle is stuck in pitch that oozed from the tree. Evidence of bark beetle attack are exit holes on the outside, left, and winding galleries under the bark. During the drought, 102 million Sierra Nevada trees died from bark beetle attack or simply lack of water; 68 million of those died in 2016 alone. But after the abundant rainfall in the 2016-17 season, the bark beetle population seems to have crashed. Landowners with 20 acres or more may be eligible for a state cost-sharing program to remove trees, reduce the fire hazard and replant new seedlings. Landowners in mountain communities who wish to revitalize their properties can contact local UC Master Gardeners for recovery advice. UC Master Gardeners are plant enthusiasts who have passed an intense training program presented by UC academics. They participate in continuing education annually to update and maintain their knowledge. 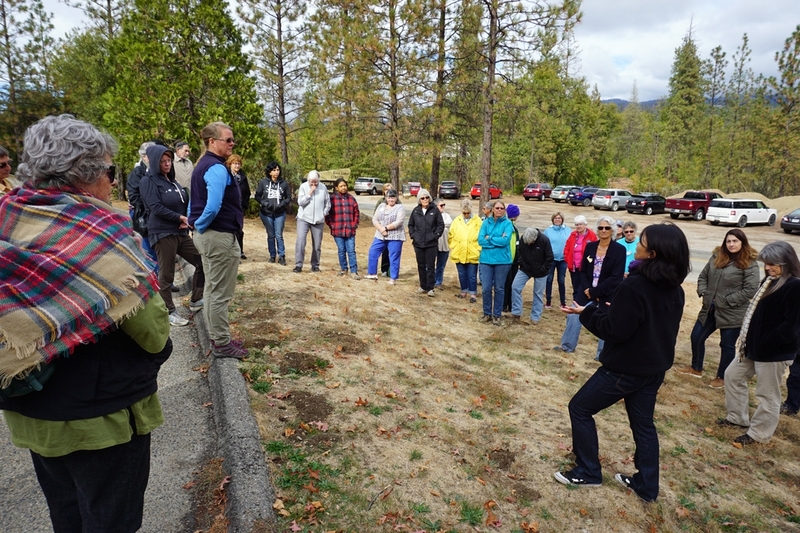 More than 60 Master Gardeners from Mariposa, Madera and Fresno counties gathered in Oakhurst in October to learn from UC scientists how to work with mountain homeowners whose towering trees have died. Similar training sessions, all funded by a grant from UC Agriculture and Natural Resources, were held in El Dorado and Tuolumne counties in June. 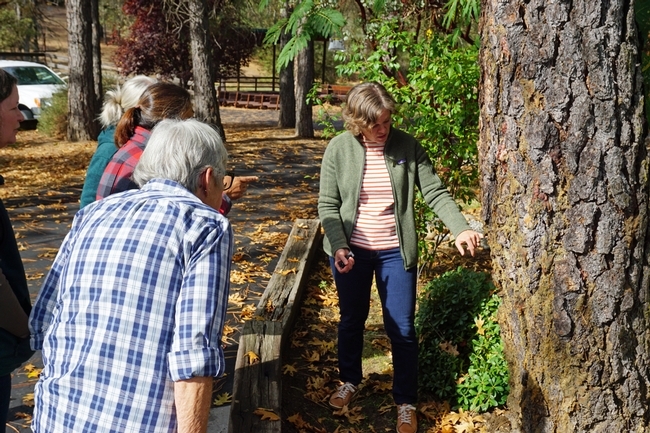 UCCE specialist Jodi Axelson points out bark beetle damage. “There is life after beetles,” said Jodi Axelson, UC Cooperative Extension forestry specialist at UC Berkeley. The scientists suggest that people who own forestland take a step back and assess the landscape after their dead trees have been removed. 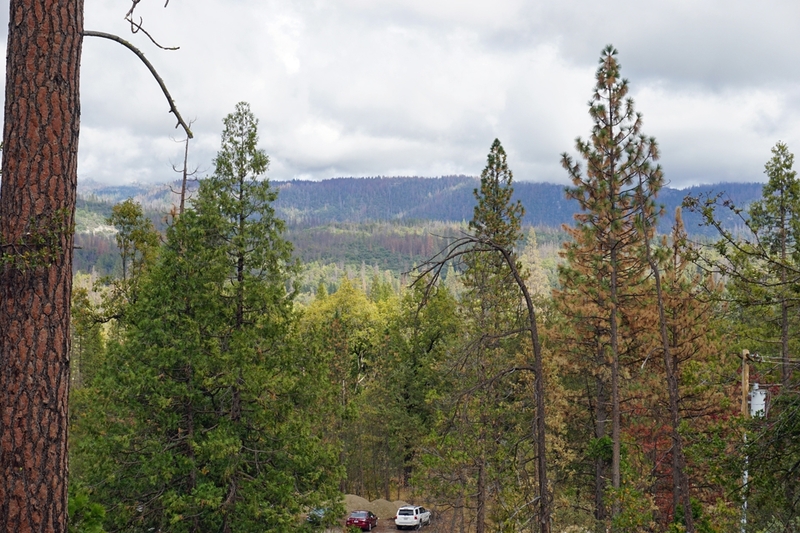 “We're seeing a lot of young cedar and white fir surviving the drought. Oaks seems to be doing really well,” Kocher said. She suggests landowners thin young trees so available sun and soil moisture are focused on the healthiest trees. Water seedlings that are receiving more sun than before to reduce stress. Planting native conifers is the best option. Due to climate change, she recommends choosing trees from a slightly lower elevation to hedge against warmer temperatures in the future. 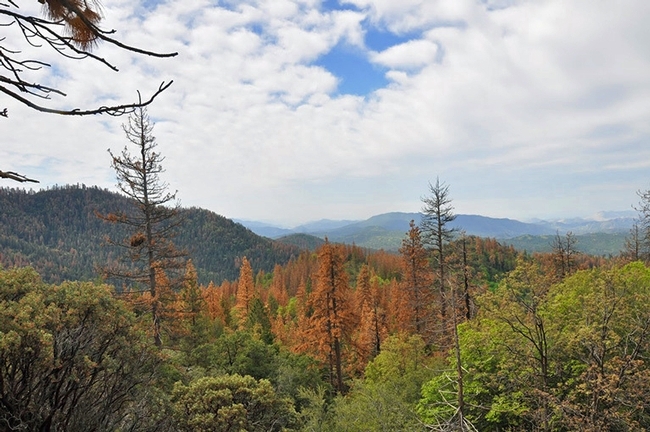 Pines are adapted to the California forest, but may need help to regenerate. When the ground is moist in the late fall or spring, plant seedlings 10 to 14 feet apart. New trees should be planted well away from homes to maintain defensible space and at least 10 feet from power lines. 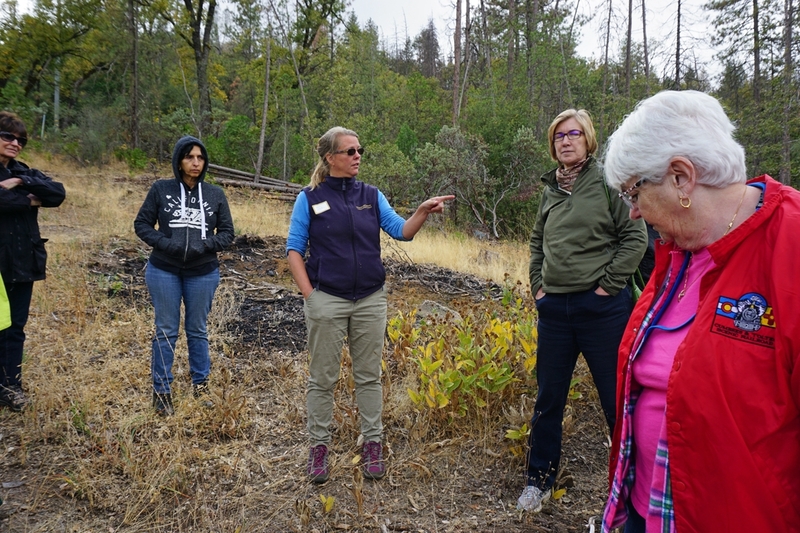 UCCE forestry advisor Susie Kocher, center, speaks during a field trip to a forest where many trees were killed by bark beetles. To help the new trees become established, cover the ground around the tree, but not touching the bark, with two or three inches of mulch and irrigate weekly during the dry season for the first few years. Pouch fungus is evidence of a bark beetle kill. 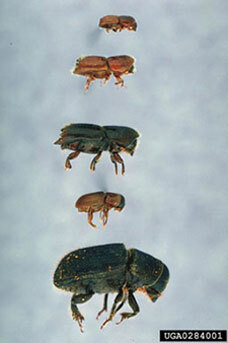 The beetles carry fungus into the cambial layer of the tree on their bodies. On recently killed trees, small white conks, the fungus' fruiting body, issues from bark beetle tunnels. UC Master Gardeners learn from experts about replanting conifer forests. 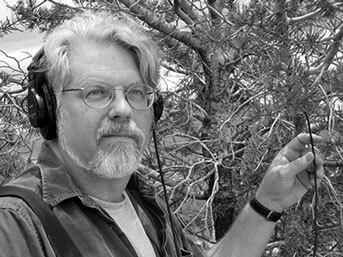 UC Santa Cruz music professor David Dunn listening to bark beetles. “When massive tree death started occurring in Northern New Mexico where I was living, I became curious if there were sounds associated with such a large amount of biological activity,” said Dunn. “At that time there was still the assumption that this was the result of a local bark beetle infestation due to drought conditions. Since then, we have come to realize that this was not just a local outbreak but one of many outbreaks across all of the western states and Canadian provinces that has been driven by climate change conditions. Many scientists think that we are experiencing the largest insect infestation of North America in the fossil record of the Earth,” he added. 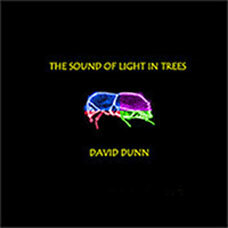 Dunn created a large sound composition, representing the incredible diversity of sounds made by bark beetles, that was released as a CD. Sound playback into a tree. “We have now entered into a period of common interests between art and science largely driven by the commonality of digital tools,” Dunn added. David Dunn at work in his Environmental Sound Lab. “Artists can sometimes ask the pithy or embarrassing question that needs to be asked, or cuts across disciplinary constraints, or politics, without paying a professional price. As Gregory Bateson, a former faculty member of UC Santa Cruz put it: ‘rigor alone is paralytic death, imagination alone is insanity.'" 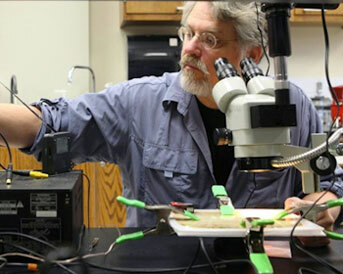 Dunn said that he and his colleagues at Northern Arizona University — Richard Hofstetter and Reagan McGuire — hope to produce a range of products as a result of their patent to combat bark beetles, as well as other insects related to them. This winter, a generous amount of rain and snow has fallen on California, but it can't erase the brown swaths of dead and dying trees in the Sierra Nevada caused by five years of drought and decades of forest mismanagement. Fire suppression and the harvest of the largest and most resilient trees in the forest led to a large population of weak trees. The prolonged drought further weakened the trees' defenses against native insects. Aerial detection surveys show that more than 102 million trees have died since 2010; more than 62 million died in 2016 alone. Public and private landowners are now struggling to recover from this natural disaster. UC Cooperative Extension forester and natural resources advisor Susie Kocher recommends dead trees be removed and the landscape reevaluated. The cost of removing the trees can be substantial. The State of California is funneling disaster relief funds through California counties, utilities are felling trees that pose a threat to power lines, and local jurisdictions are removing trees that could fall on roads and other public infrastructure. However, most tree removal is the responsibility of private landowners. When the dead trees are gone, before considering replanting, Kocher suggests Sierra residents carefully assess what has survived. Kocher suggests nurturing the remaining young trees. “You may want to thin trees out so that available sun and soil moisture are focused on the healthiest individuals. Some watering in the summer may help counter stress caused by increased solar radiation,” she said. If removing the dead trees leaves the landscape too bare, replanting native conifers is a good strategy. Conifers include pine, cedar and fir trees, but in California's dense forests, firs and cedars – which do well in shady conditions – are beginning to dominate. Replanting may be a time to give native pines – such as Jeffrey, ponderosa and sugar pines – a chance to recover ground. 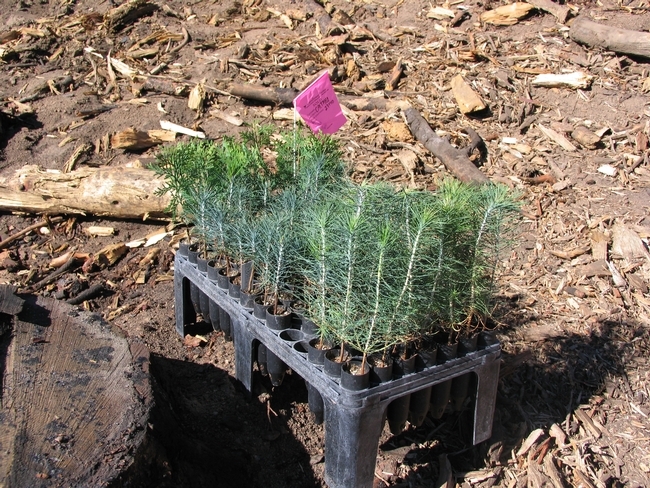 Replanting may be a time to give native pines a chance to regain a foothold in Sierra forests. Native plants and shrubs that died during the drought or were damaged during tree removal will likely come back on their own without replanting. Shrubs and oaks can re-sprout and native herbaceous plants generally store seed in the soil that will grow under native rainfall conditions. Space trees at least 10 feet apart. Trees and flammable vegetation should be kept at least 10 feet away from the home, planted sparsely within 30 feet of the home and spaced widely enough in the 30 to 100-food zone so the crowns of the trees will not touch when they are mature. Beyond 100 feet, trees can fill into a more natural looking forest. Plant trees at least 10 feet from power lines. Do not plant trees within the road right of way to prevent interference with snow clearance, maintenance and construction projects. Plant pines where there is a lot of sun. 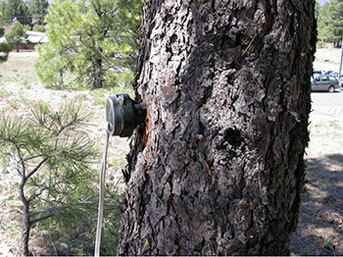 Do not plant sugar pine on the driest sites. Avoid planting where the mature trees will block desired views.